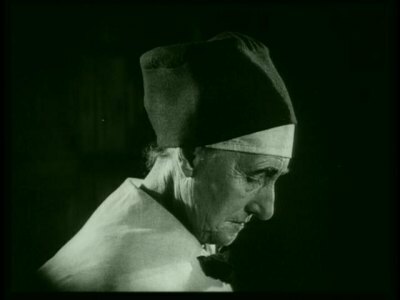 Recently, I viewed two of the earliest works of legendary director Carl Dreyer: The Parson’s Widow (1920) and Leaves from Satan’s Book (1921). It was truly surprising to me just how powerful they both are. I know his famous films, but I wonder if the paucity of praise for these earlier pieces is due simply to scarcity. The Parson’s Widow is largely a departure from the usual Dreyer tone; it is a comedy, albeit one with creepy religious figures and a poignant moral tale at its heart. The new parson of a small village, a young man named Sofren (played by Einer Rod), discovers that he must marry the widow of the former parson. Unfortunately for Sofren, he already has a fiancée, Mari. The two decide to wait hopefully for the Widow, who is much older, to die. When she does not die, the two secret lovers try with various attempts to scare the old woman to death. Soon though, they discover that the widow is not someone to be trifled with. There is quite a bit of overacting on the part of Sofren, but he does a fair Chaplin imitation when it is called for. By far the most interesting figures are the Widow Margarete herself, played sternly and subtly by Hildur Carlburg, and the looming shadow of Sofren’s glaring hypocrisy. What is so devastating is that we join in this hypocrisy; we too want the Widow to die. We cannot discern if she is truly a witch, but we know for sure that she is in the way of our hero and his fiancée. What a marvelous thing Dreyer does to drag us from an engaging comedy into a sharp moral tragedy. Why does it work so well? Because we recognize ourselves in the parson and his fianceé, and we have felt that guilt before. This entry was posted on March 22, 2010 by Ian Kay. It was filed under The Parson's Widow (1920) and was tagged with dreyer, parson's widow.